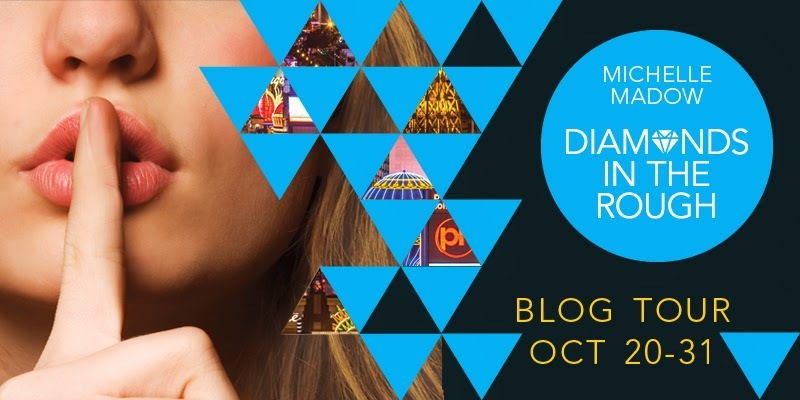 I'm beyond excited to welcome Michelle to my blog today and that I got to ask her the question I've been dying to know, and get to read the incredible addition to the Diamond Sisters series! I love, love, loved the first book in the Diamond Sisters series, so it's no surprise that I was over the moon to get to read Diamonds In The Rough early. And Michelle is such an amazing writer, I knew I'd get hooked in right away. If I loved The Secret Diamond Sisters, then they'll need to invent a new word for how much I adored Diamonds In The Rough. The drama, romance and secrets that broke at the seams were bound to win my book-loving heart and they did completely. In the second book, I loved the characters more than ever. With four different POV's, it wasn't a problem to keep myself hooked to the plot, with Michelle's amazing way of giving each person their own recognizable way of acting and talking. My favourite character has always been Peyton, but slowly, Courtney was creeping in to stealing the top spot. Although Madison's feisty characteristics and ways of spilling the Diamond Sisters' secrets made her their enemy, she is still one of my favourite "enemies" from any series I've read. And I could just picture Savannah singing and winning over hearts with her gorgeous voice. That's the thing I love about Michelle's writing, that the story comes to life within my mind and it's no longer just words, but an actual story. Las Vegas is one of my want-to-go places and in Diamonds In The Rough, it's only encouraged that more. The bright, lively and extraordinary sights were in my mind the whole time I was reading (and peaking at the gorgeous cover art!). Overall, this series is clearly not to be missed. With unique, vibrant and compelling characters, there has to be a place on your shelf for the Diamond Sisters. Michelle created a world where three sisters lives had been turned upside down by finding out that their long-lost father is a billionaire, and the mayhem doesn't even end there - it's just beginning! Fabulous, daring and charming, Diamonds In The Rough is a five-star read that I'll be telling anyone who will listen to read. 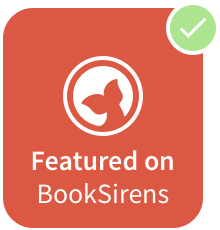 Book-lovers of Young Adult Contemporary novels! • If the books were turned into a movie/tv show, who would be your ideal cast? Savannah Diamond: For Savannah, I see Danielle Bradbery. She has Savannah's petite features, and since she won The Voice, I know she has Savannah's singing voice! I'm not sure if she's an actress, but she looks exactly like Savannah. Another actress who I think would be a perfect Savannah is Peyton List. Courtney Diamond: Alexandria Deberry is my first choice for Courtney Diamond. She has Courtney's sweet look, and long blonde, wavy hair. She just looks so nice in her pictures, and I can see her in the role perfectly. I can also see Ashley Bensen, from Pretty Little Liars! Peyton Diamond: Tracy Spiridakos is my top choice for Peyton. She has Peyton's high cheekbones, and tough attitude. Add a few blue streaks, and she's perfect! Carlson Young would also be a good choice. Madison Lockhart: Nina Dobrev is my perfect Madison! She has the long dark hair -- all she would need is blue contacts. Plus, she's an excellent actress, as proven by how she plays both Elena and Katherine on Vampire Diaries. Oliver Prescott: Cody Christian (who plays Aria’s brother in Pretty Little Liars) is perfect for Oliver! Dark hair, and he totally has that confident player vibe about him. A young Sean Harris would also work. Brett Carmel: I've pictured Steven R. McQueen as Brett since the first draft of the book! He has that intense, artsy, brooding thing about him -- but it looks like he can also be super sweet and loyal to the people he cares about. Damien Sanders: Robbie Amell is exactly how I pictured Damien! Dark hair, dark eyes, and built from going to the gym often. He's not a teen anymore, but I also always imagined Damien as looking the most mature for his age. Nick Gordon: Nick is the hardest for me to cast, because I've always had a perfect image of him in my mind -- blonde curly hair, blue eyes that sparkle when he smiles, round face, and just a very all-American look. The closest I've found so far is Jeremy Sumpter. Adrian Diamond: Peter Facinelli. Yes, I know he's Carlisle from Twilight. But I've always seen him as Adrian! Rebecca Carmel: Charisma Carpenter would be a great Rebecca! She's dressed a little more scandalously in most of her photos than how Rebecca would dress, but she still has the right look. 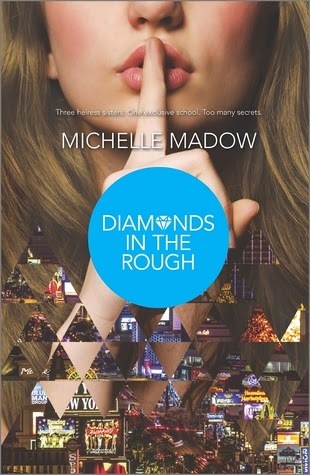 Have you read The Secret Diamond Sisters or Diamonds In The Rough? Tell me in the comments, on twitter or by using the hashtag #DiamondSisters happy reading! Love the post! I love seeing who authors picture as their characters. So excited for more glitz and glam as the series continues. Michelle's an awesome writer! Sounds like a fantastic series! Beautiful cover!